propulsion of a boat by means of oars. As a sport, it involves watercraft known as shells (usually propelled by 8 oars) & sculls (2 or 4 oars), which are raced mainly on inland rivers & lakes. The term rowing refers to the use of a single oar grasped in both hands, while sculling involves the use of 2 oars, one grasped in each hand. Rowing began as a means of transportation. Galleys, used as war vessels and ships of state, prevailed in ancient Egypt (on the Nile River) and subsequently in the Roman Empire (on the Mediterranean) from at least the 25th century BC to the 4th century AD. Rowing was also an important adjunct to sailing for the Anglo-Saxons, Danes, and Norwegians in their waterborne military forays. Under FISA rules, all races take place over a 2,000-metre (6,560-foot) straight course on still water, each crew or sculler racing in a separate, buoy-marked lane. Racing shells range in overall length from 18.9 metres (62 feet) for an eight, 13.4 metres (44 feet) for a four, and 10.4 metres (34 feet) for a pair, to 8.2 metres (27 feet) for a single scull. There are no specifications for weight, which varies according to materials. In An Introduction to Rowing, Nick Mathers traces the sport from its roots in ancient warfare to its state today. Rowing is one of the oldest and most physically challenging sports still in existence today. Like swimming, rowing utilizes every major muscle group in the body: legs, abdomen, chest, back & arms. Rowing originated not as a sport, but as a means of warfare & transportation. All of the major ancient civilizations used rowing to advance their cultures, both in war & at while at peace. A majority of the war between the Persians & the Athenians was fought in huge naval battles. The victors of many of these sea battles were those that could maneuver quicker on the water (the Athenians frequently won because they used a form of a moving slide in order to incorporate their legs). Viking ships were equipped for many oarsmen. A single square sail was used, but only when a tailwind prevailed. So, the legacy of piracy & plundering of the Vikings was made possible, in part, by the speed of attack they could achieve in their rowing ships. The sport of rowing unofficially began in the 1700's when watermen would race in long barges on the river Thames in England. The sport began its modern incarnation when "gentlemen" created the Oxford-Cambridge race in 1829. The Henley Royal Regatta was started in 1839. The Yale-Harvard race on the Charles River marked the beginning of competitive rowing in the United States in 1852. 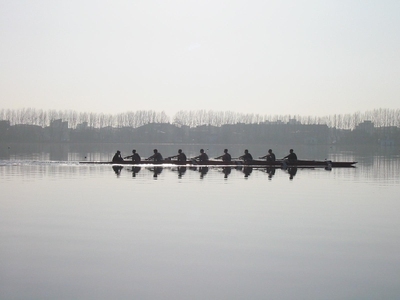 Rowing became the first organized collegiate sport in the U.S., complete with its own governing body. Today, men's collegiate rowing in the U.S. remains independent of the NCAA, while women's rowing became a NCAA sport in 1997. International championships were first arranged in 1893 & remain under the direction of the Federation International des Societes d' Aviron (FISA). International rowing (& collegiate rowing) competitions are standardized at 2000 meters. Masters championships (both national & international) are contested over a distance of 1000 meters. At the elite level, 2000 meter race times average between 5:20 & 7:30 depending on boat type. Masters races last between 2:50 & 5:00, again depending on boat type as well as age of the contestants. Sweep oared races are contested in 2, 4, and 8 person boats (known as pairs, fours & eights respectively). Sculling races are contested in 1, 2 & 4 man shells (single, double & quad). Steering in sweep oared boats is accomplished with the use of a movable rudder. It's handled by either a steersman (known as a coxswain) who sits in the bow or stern of the boat (depending on the construction & size of the shell), or a rower in bow or stroke seat using a foot-controlled rudder ("toeing"). Singles & doubles are usually maneuvered by a change in pressure between the port & starboard oars. A quad is typically controlled with a foot rudder. International rowing is contested in 2 weight categories for men & women, lightweight & open. Lightweight oarsmen are restricted to a body weight of 72.5 kg (men) & 59kg (women). The average weight of the open class (heavyweight) in international competition is about 92 kg (200 lbs) & 79 kg (173 lbs) respectively. Second to rowing & coaching, one of my favorite things is talking about rowing & coaching. Rowers are often caught talking about this race or that race & about how great crew is & how much they love the sport. I've been told that crew is a love it or leave it sport. And those of us who love it can't get enough. So, I've been wondering what makes it so great and why it consumes us. Non-rowers ask, "Is crew fun?" Well, think about the basics of the sport: going up & down the slide, putting the blade in the water, over & over & over. No. It's not fun. What's fun about that? Sure, sometimes there's interesting scenery & sometimes the weather's nice. It's fun to hang out with your teammates after practice. But, catch-finish, catch-finish? It's not quite a birthday party at Chuck E. Cheese. But, there seems to be something in addition to the actual rowing that makes it irresistible. There are some things I know I like about the sport. I like waking up in the morning & feeling my whole body ache. I can feel every muscle & know it's there. I know I'm alive. On days when I'm doing sprint pieces, I love to feel the lactic acid burn in my legs. Then after a rest, the first few strokes of the next piece feel like a dream as the lactic acid is used up by pushing off the foot stretchers. I could go on, but are these the reasons I, or anyone else rows? No. They're merely the symptoms of a greater love. Hard work. As a rower, you get to test yourself. Everyday, you go out & row as hard as you're capable of. You push your body & mind to their limits & by doing so, you expand those limits. That's what people talk about when they talk about crew. They talk about how hard they've worked. They talk about how great it feels to achieve new milestones. They boast about achieving feats they once thought they couldn't & doing things others choke at the thought of trying. Our junior rowing director, Charlie Doyle, likes to say "Anything is possible in the sport of rowing." Anybody can win a race, if they've worked hard. That's what's great. If you decide every day that you're going to be a champion, you can be one. When an entire boat executes their strokes with precision, the shell balances perfectly & smoothly glides thru the water. At the catch, the oarsman places a square blade into the water quickly while minimizing the disturbance to the shell. The rower's arms are extended outward, torso is tilted forward & legs are compressed. With their head upright & shoulders relaxed, the rower is like a loaded weapon waiting to fire its ammunition, in this case a smooth & powerful stroke thru the water. The proper catch produces a minimal amount of back or front splash & causes no check. The catches of all members of a boat must be indentical. Out of time catches cause balance problems & reduce a boat's speed. Boats gain their speed on the drive. In this portion of the stroke, the oarsman simultaneously pushes his legs, pulls his arms, and swings his torso away from the stern of the boat. The handle of the oar is pulled in a clean flat motion towards the bow of the boat with a constant application of preasure. In order for this cycle to repeat itself (it will need to 200-250 times in a 2000m race), the oarsman must slide towards the stern of the boat and prepare his blade for the catch. This portion of the stroke gives provides rowers with a brief rest; hence its name. Crews exhibit an approximate 2:1 ratio between the time spent on the recovery and the time spend on the drive. Good crews display a marked rhythm - powering quickly through the drive and relaxing on the recovery. Losing crews often have "negative ratio" - laboring on the drive and rushing the recovery. From the finish position, an oarsman pushes his hands away, swings his torso towards the stern of the boat, and then slowly contracts his legs and pulls his body up the slide. Torsos moving towards the stern in sync create a sensation known as swing. At the end of the recovery, the oar is gradually squared (the blade of the oar becomes perpendicular to the surface of the water) and prepared for the catch. I've been crying a lot lately. It's mostly from the mental and physical exhaustion that comes when you're trying to excel in school and in rowing, while still maintaining a life outside of it all. I don't get home until seven in the evening, on a good day, and yet, I can't blame all of the stress on my busy schedule. Most of the tears are my own fault. T.C. Williams Crew was the first thing I'd ever really been proud to be a part of. The program is amazing - thanks in part to our booster club, our coaches, and the dedicated rowers that come out every day to battle pain on the ergs or on the water. Our Varsity girls won Stotesbury last year -- our lightweights have won it four years in a row. To say the least, our team is good. So shift now from those gold-medal crews to me in my novice year. Walking into the boathouse was like walking into a huge trophy case; the plaques from year after year of victory were up on the walls and there were pictures of Olympic athletes who had started rowing right here. Rack after rack of the long shells were lined up in the bays, and as I saw them for the first time, I swallowed hard; I couldn't imagine myself ever getting into one of them, let alone winning. I rowed the first day and liked it, but I can't say that I was addicted yet. I didn't truly love it until I felt the pain for the first time - that suffocating, intoxicating pain that comes with the really hard pieces. I got off of the erg that day, my head spinning from lack of oxygen, my legs nearly collapsing underneath me, and I had never felt better in my life. Something about that pain lit a spark inside of me and I knew that I would never feel good again if I didn't continue. It's like conquering any self-doubt, any weakness, any questions inside of you in order to keep going. If you think too much, you can't go on. The drive to win has always been there, but lately it's been screaming inside of me even more than usual. I always have to pull a little bit harder, lift a little bit longer, hurt a little bit more. If I finish a piece and I'm writhing on the floor because I can't breathe, it won't be enough if the person next to me pulled more meters. I am a perfectionist, and I want it so much that I'll pass out before I'll give up. Nevertheless, I have only been rowing for a little over two years now, and as I'm doing select crew this fall, it has become apparent to me that even working as hard as I do, some people will still be better. The thought killed me at first, and every day at practice I resented everyone who lifted more weight than me or finished pieces before I did. It has only come to my attention in the last few days that rowing wasn't fun anymore because of the enormous amount of pressure I was putting on myself. I was starting to hate it, and it's not worth it to hate it, even if I were better than everyone else. Crew is about you against your own pain - not against the clock or the other members of the team. If you pull every stroke harder than the last, it doesn't matter where you placed among the group. You still won. I rowed with a renewed spirit the last few days of practice this week. The pain that I felt from the first day is still there, and I still get the same unbelievable feeling when I'm finished with a piece and I hurt so much that I can't move. Crew is so different from everything else I've ever done, because there's no meticulous thought process. Everything you need is deep inside of your soul - you either want it or you don't. Select crew will be over in November, and then I'll start the long training season to be ready in the spring. I may not be on a gold medal crew this year and bring back another plaque to put up on the wall, but I know for sure that I'll try. And if what they say about "who wants it the most" is true, I'm pretty damn sure that my name will be up on that list with the winners.